Entry by MissKainan on Tue Apr 9 22:33:06 2013. 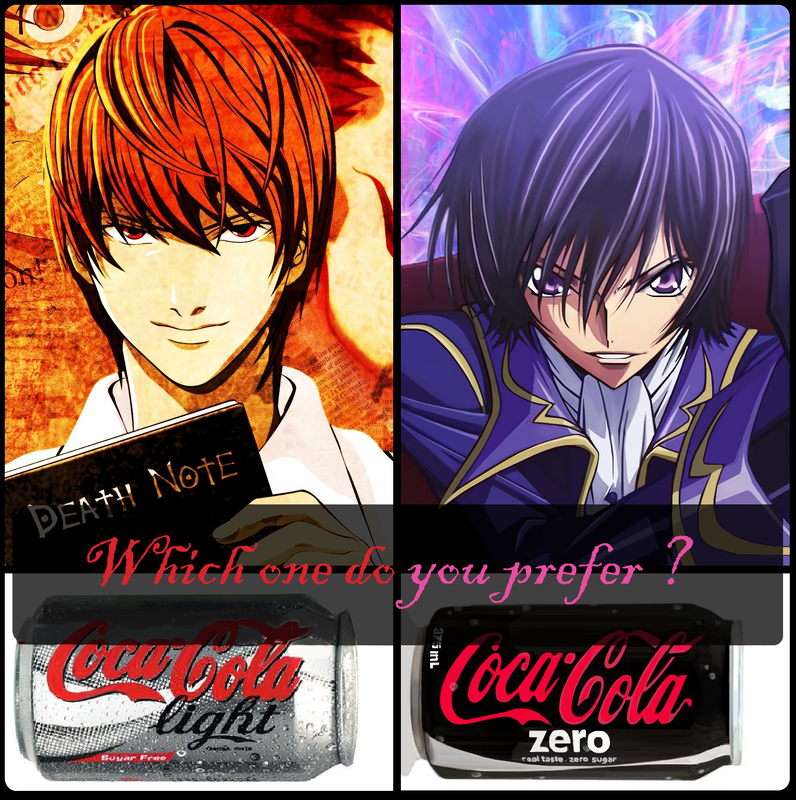 Zerochan923600, DEATH NOTE, CODE GEASS: Hangyaku no Lelouch, Lelouch Lamperouge, Yagami Raito, Canned Drink, Death Note (Object), Coca Cola, Demotivational Poster, Choose One! I like Zero...Coke Zero,and Zero! Clever! xD Lol at the typo. Zero!!! forever C:!!! mai love Lelou!!!! GEEENIIUUUUSSSSS XD coca cola light pls. XDDDDDD or maybe....both? I don't drink Coca-Cola, but if I had to choose, then I'd pick without hesitation ZERO ! Seeing this makes me feel extreeeeeeemely stupid. But it is so winful~! They're both cool, but definitely Lelouch. Unlike Light, he's not EVIL. He's not completely good, and he does some bad things, but he's not evil. << >> << >> << >> I can't choose!!!!!!!!!! Light. Death Note is the best series ever. Damn this poster is pure epic genius!! @Its_Pokabu_NOT_Tepig no that zero guy is not a character they meant about Coca-Cola Zero oh and by the way ZEROOOOOOOOOOOO!!!!!!! 4. Light kills anyone, unlike Zero, he kills the REAL bad guys!!! Coke Light. He needs more love. Well, I might as well get this off my chest. Lelouch is the only person who has made me question my sexuality. I'm not gay, but something tells me that if Lelouch were real, I would be. But i will take Zero xD. Zero. He's just comlpetely awesome. Team Lelouch v. Team Light. I harbor a hatred for Light so I'm definitely choosing Zero x) Zero/Lelouch is a MUCH better person than Light. yo quiero los doooos .. Zero because Lelouch had more of a considerate idea for the world and the people. Unlike like Light, who only held his idea of 'Justice'. Am I the only one who thinks of Vampire Knight Zero instead? I'll gladly take him. Light killed my Baby L, so I choose Zero. I don't even XD. And 'wich'. But still pretty awesome. Death Note is a way better series than Code Geass, so Light. I do not drink Coke but I guess I would choose Zero. What of I don't like Coca Cola? I don't like either drink. I prefer regular Coke or cherry Coke. Who would be regular or cherry Coke anyway? ^ That just made my day. BOW TO THE MIGHTY, LIGHT!! As much as I love Lelouch and Light, I can't stand diet soda. I'll take Pepsi...who the hell would Pepsi be??? This is awesome. But i'm going to choose 'Zero' or rather Lelouch no matter what. Despite having watch Death Note and not watching Code Geass and only knowing the outline of Code Geass. Even if i personality know Light better, but for now only, just you wait until i get to watch Code Geass. I'll still choose Lelouch. He also had other people close to him, like friends, the Black Knights, Nunally, etc. Light had less people he cared about and plus he was killed by Near or someone in the end and he went crazy trying to justify his own actions. ps: he's also a tad bit better looking and cooler in my opinion but that's not the main reason. WHAT IS WRONG WITH YPU PEOPLE?! LIGHT ALL THE WAY, BABY!! Dislike both of them, but I'd choose Light only because I love Death Note more than Code Geass. Zero. I love the drink, anyway.